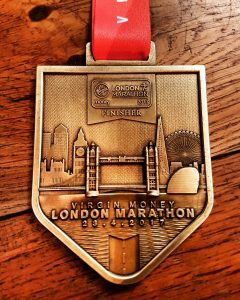 On 23rd April 2017 Brian Wassall completed the London Marathon for Act4Africa. World-renowned, the London Marathon is spread over a fantastic course. Setting off from Greenwich Park, runners pass the capital’s most iconic landmarks for 26.2 miles to come to a stunning (and rather sweaty) finish on the Mall. 45 years young (! ), Bri was born and bred in Congleton where he lives with his wife Helen and two children. He joined the Royal Navy at sixteen as a Marine Engineer, serving for eight years. In 1996 he joined AstraZeneca, Alderly Park where he works as a Utility Plant Controller. Bri had previously run the Congleton Half Marathon in aid of Help for Heroes, and is also a dedicated member of Boalloy Running Club for whom he takes part in summer and winter events in the surrounding area. 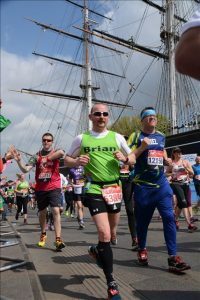 Bri knew he wanted to cross the prestigious London Marathon off his bucket list and raise money for another charity. He heard about Act4Africa through friends and was inspired by the important work we do for women and children in impoverished African communities. Congratulations Bri on your achievement! 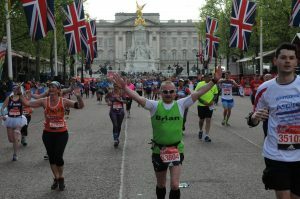 Bri’s fundraising page is still open and we encourage you to spare a few pennies (or pounds!) in recognition of his achievement for a great cause! For every £1 you donate, 90p will go directly to our projects in Africa. Please click here to donate online. Thank you.